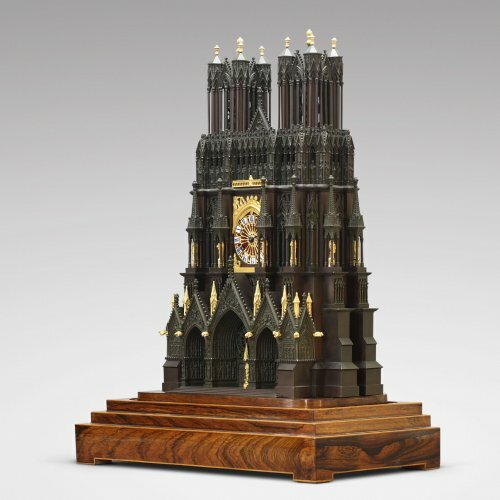 The case in patinated bronze of two different colours and ormolu. 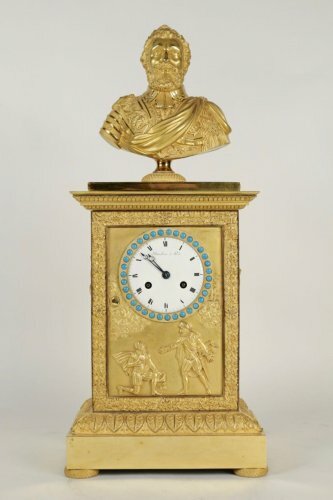 Paris-type movement with recoil anchor escapement and silk-suspended pendulum, made by Honoré Pons and stamped Pons - Médaille d’Or 1827. 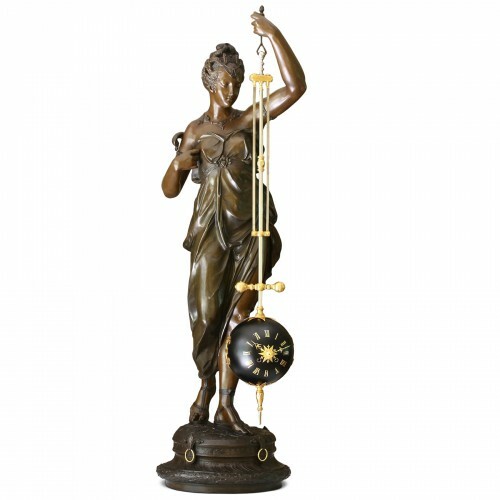 Half-hourly countwheel strike on a steel gong placed in the base and chiming to the sound of a local church bell. 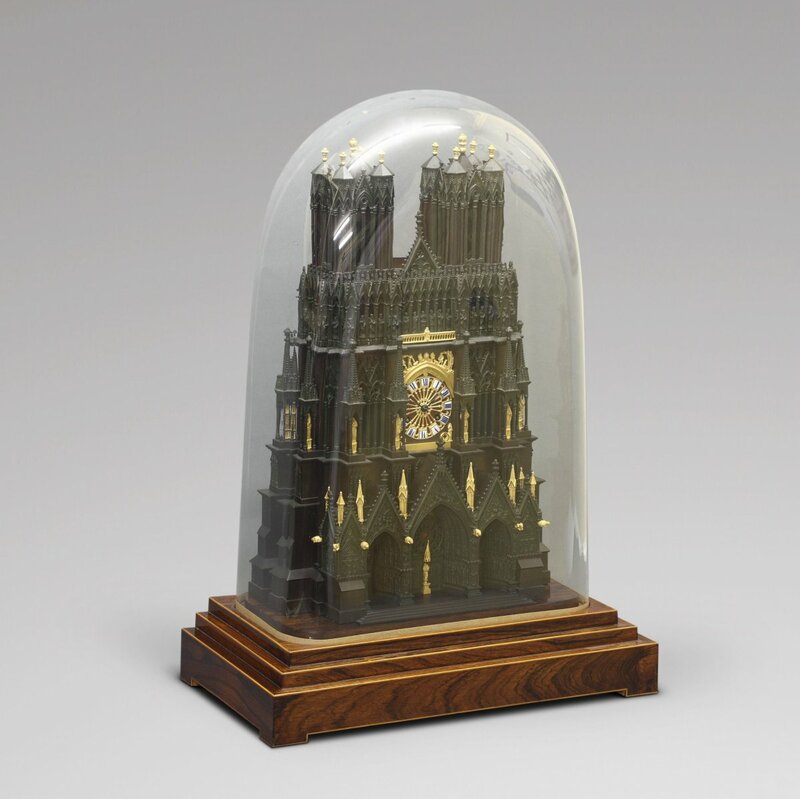 Autonomy two weeks. 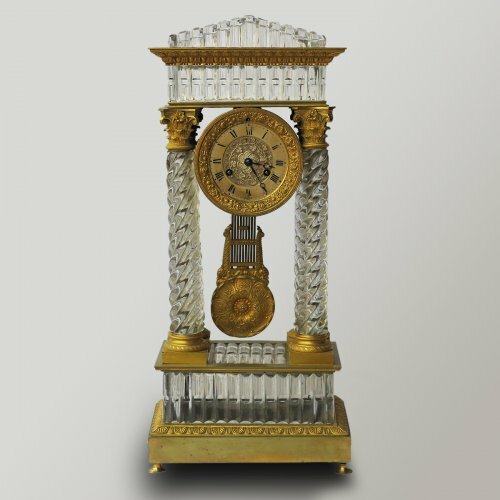 The clock dial, set in the façade in place of the rosette window, the enamelled metal dial painted to give the illusion of stained glass, the individual Roman-hour chapters in blue on white enamel, the blued steel hands in the form of partridge eyes (oeuil-de-perdrix); the case, the majority in patinated dark green or brown, the details accented in chased gilded bronze, backed with bright enamel-painted brass panels to give the illusion of stained glass; on a tulipwood veneer base enclosing the chime; original glass dome. With its three portals and two towers, the present model is an accurate reproduction of the west façade of the cathedral at Reims built during the thirteenth century. Made according to strictly calculated dimensions, this perfect scale model of the cathedral can itself be justly considered a masterpiece of construction and chasing. Pinnacles, gables, bell towers, arcatures, open-tracery windows, portals and flying buttresses are all faithfully reproduced with the greatest attention to detail, starting from the incalculable number of cast bronzes. 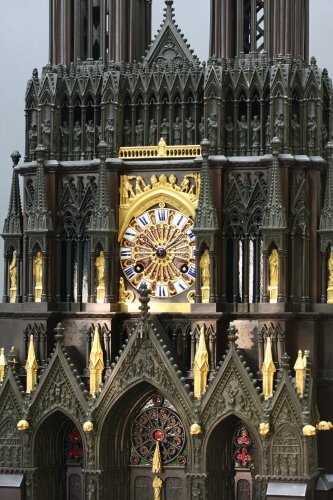 Plainly visible is the ‘Gallery of Kings’, which shows the ‘Baptism of Clovis by Saint Remi’ in the centre, flanked by 56 statues. 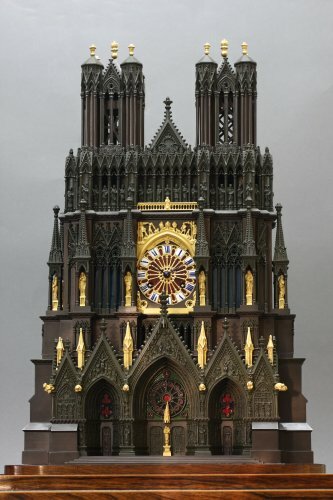 Below, the three portals are also perfectly reproduced: the central portal is dedicated to the Virgin Mary, her life and glorification, surmounted by a gable representing the ‘Coronation of the Virgin’; the south portal, in the surmounting gable, has a representation of Christ on the throne at the ‘Last Judgement’ surrounded by angels carrying instruments of the Passion; the north portal is dedicated to the ‘Life and Passion of Christ’. The enamelled and gilded dial is designed after the motif of the rose window’s second corolla featuring a flower design with twelve petals, each split in two. The choice of polychrome bronze, contrasting patina and gilt, allows for full appreciation of the architectural details and fine ornamental craftsmanship. 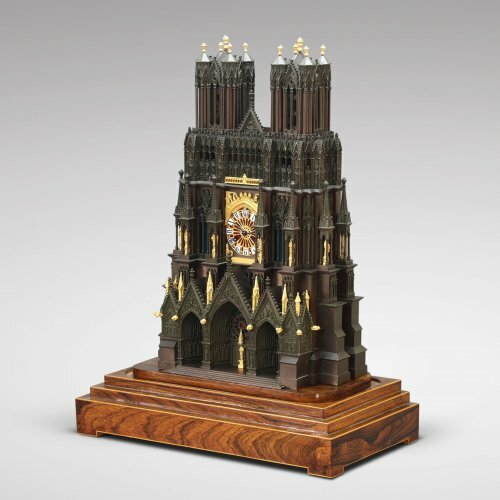 In effect, it is the different colours of patina that make the present model all the more rare and sought-after. 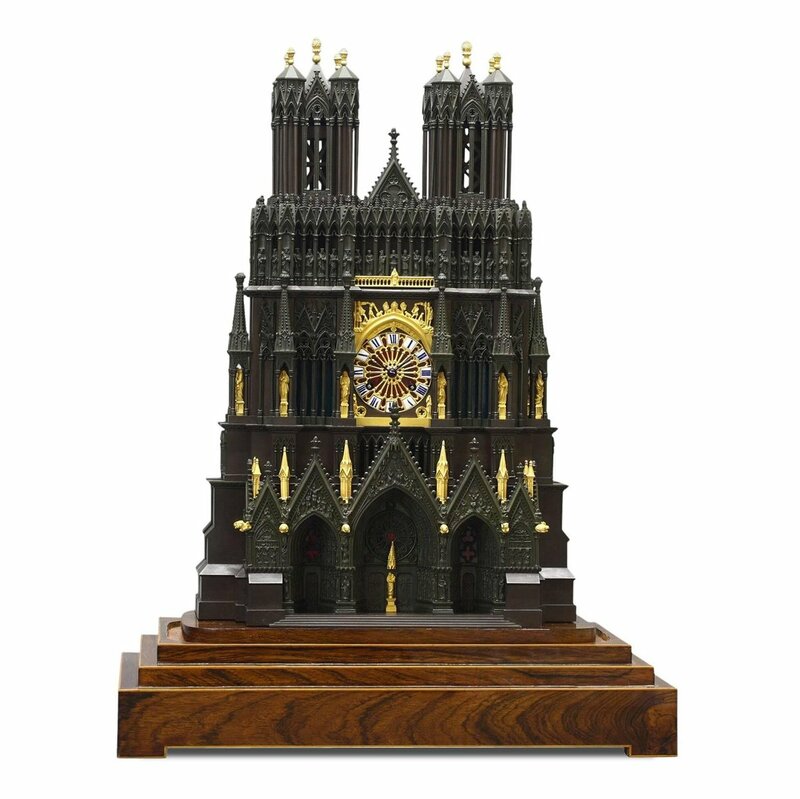 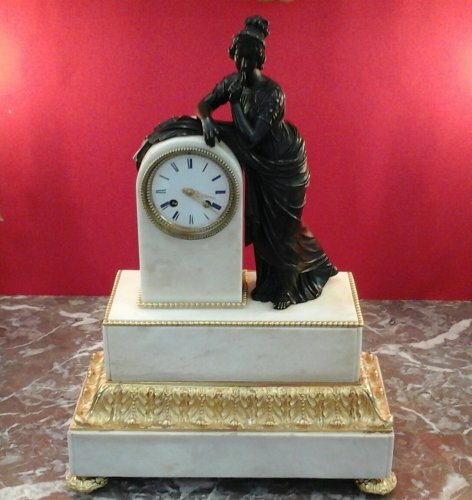 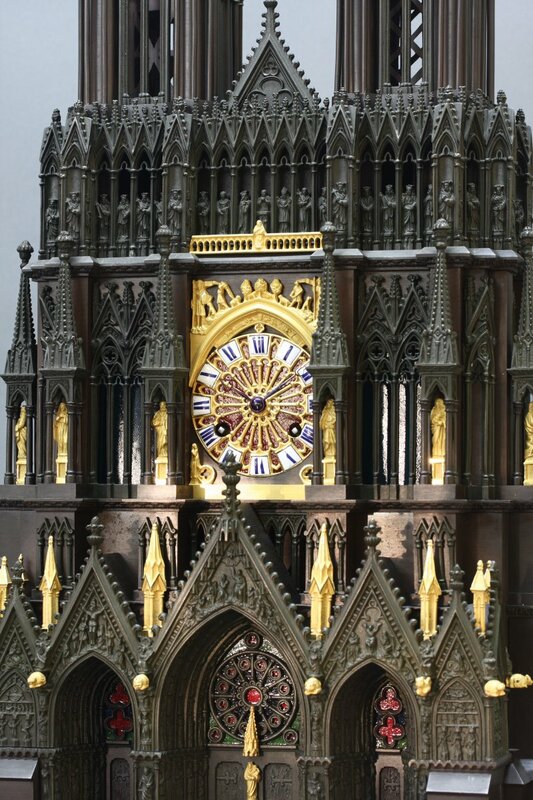 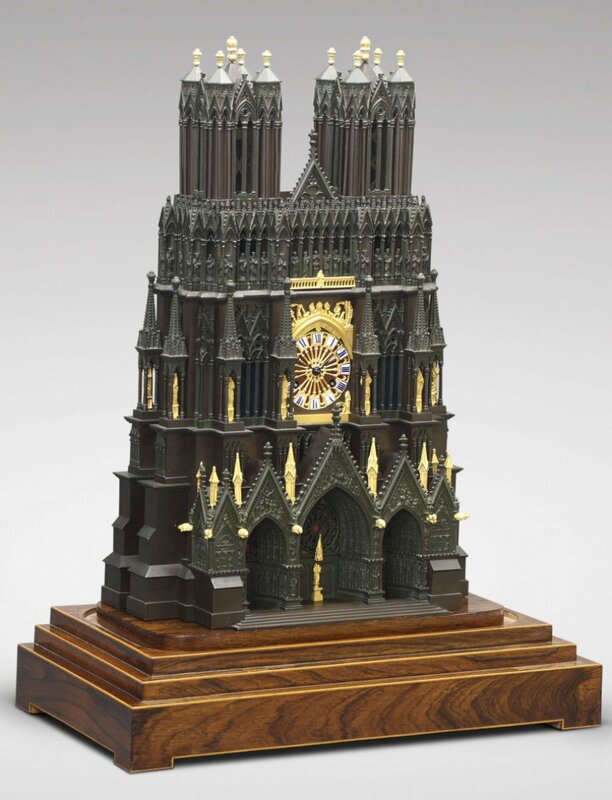 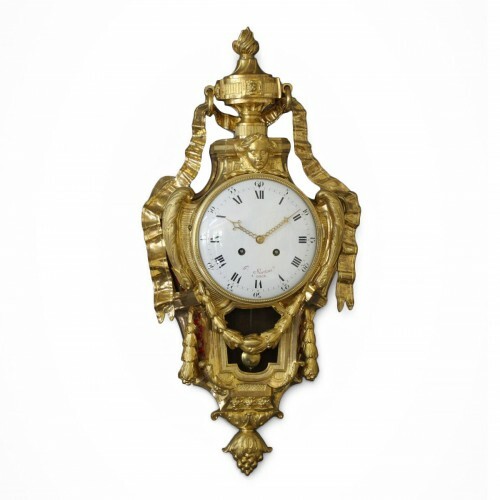 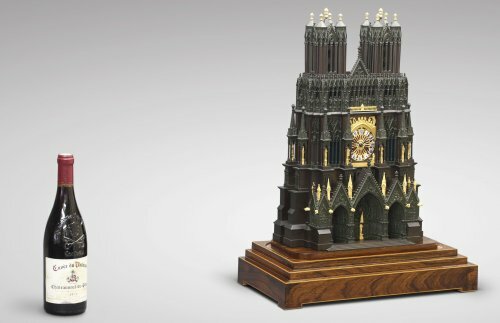 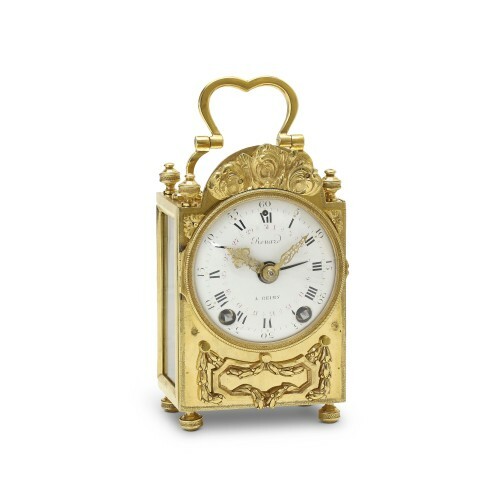 For during this period, the majority of clocks known as "à la cathédrale" were made entirely in gilded bronze.